Like Monty Python’s Norwegian Blue parrot, the rather repulsive blog Barnet’s Third Eye is not dead. It is merely resting. Due to the way the internet works, copies of web sites can remain available for anyone to view, long after they have supposedly been deleted. So it is with Barnet’s Third Eye, written under the pseudonym of Boombastic. Barnet Council Watch is the first to defend freedom of speech, but if you wish to be taken seriously as a blogger, there is a line which should not be crossed. There is nothing wrong with strong criticism of your political opponents, but Barnet’s Third Eye was pure filth which went far too far in its attacks on Labour. Just as Damian McBride was forced to resign for proposing a smear campaign against senior Conservatives, so Boombastic’s days must be numbered. It has long been suspected that Barnet’s Third Eye was written either by a Conservative councillor or someone with close links to the Party. 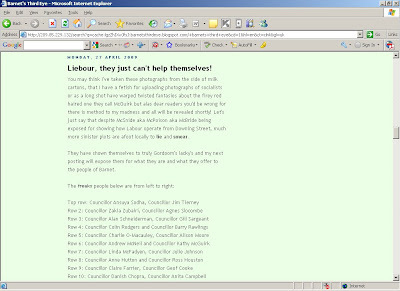 Barnet Council Watch has now been given the name of the author by two reliable sources. Mr Freer is clearly aware of the damage that Barnet’s Third Eye could cause to the Conservatives as they attempt to win the moral high ground from Labour, which is why he must now act decisively and start the process to remove the whip from Boombastic if this juvenile delinquent will not resign voluntarily. it's gone - looks like you were right, it was one of the local tories and freer has put his foot down after reading your post. There are still traces of this blog which can be found on the internet. There are also copies of the web pages and images (which have been saved for posterity) doing the rounds. Getting the blog removed should be seen only as a first step. The person responsible must have the Conservative whip removed mmediately. If not, it will come back to haunt Cllr Freer. Even Gordon Brown, who is totally out of sync with the British public, knew when it was time to cut loose of Damien McBride.